Throughout my collegiate swim career my coaches and trainers would often bring up the concept of “Lactate Threshold”. I would nod my head having an idea of what they were referring to, but didn’t fully understand the physiology behind this concept. After taking an Exercise Physiology class my 5th year at UC Berkeley, I finally understood this principle and learned its importance in elite level athletics. This post will explain what Lactate Threshold (LT) is and how you can use it to your advantage in training. What is Blood Lactate? Why does it accumulate? Simply put, blood lactate is the level of lactic acid in your blood. Monitoring this level is a very effective way of evaluating an individual’s training intensity. The production of lactate during exercise is the result of multiple molecular processes. However, here is a simple way to look at it: First, skeletal muscle fibers contract during exercise. Second, as exercise difficulty increases, there is a production of hormones to accelerate the use energy. Third, the byproducts of these accelerated processes end when they are converted into lactate. The body has processes to remove lactate, however blood lactate begins to rise when it’s produced at greater rates than it’s removed. Lactate threshold is the intensity of exercise at which lactate starts to accumulate, as clearance mechanisms cannot keep up. Here is a graph of MY lactate threshold based on a progressive cycling test where the workload was increased by 50watts every 3 minutes. 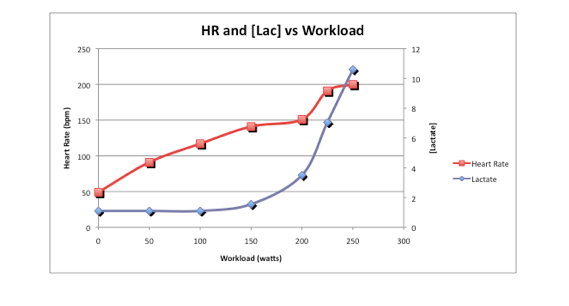 Lactate and heart rate were recorded at every workload increase. As you can see once the workload increased to over 150Watts my blood lactate levels begin to rise exponentially. At this workload my lactate clearing mechanisms fail to keep up with the production. My lactate threshold when I took this test in November 2012 was 150watts as this is the greatest workload I could sustain while my lactate production and clearance were matched. Why is determining your Lactate Threshold Important? Determining your lactate threshold can help individualize your interval training. Interval training is a regimen in which there are periods of specific exercise intensity mixed in with periods of rest. There are many advantages to this type of training. First is learning what a specific pace feels like. Second, it can help athletes understand the periods of rest to optimize their recovery and allow for repeated bouts of exercise at higher intensities. Lastly, interval training can help train the body to stimulate mechanism to clear blood lactate levels more efficiently as the high intensity exercise bouts will cause a rise in blood lactate. How can you determine your Lactate Threshold? The most accurate way to determine LT is to do a progressive exercise test with blood lactate, heart rate and ventilation analysis, as seen in my test above. Testing facilities are all over the country at many universities and health centers. However, these tests usually cost between $100-$200 dollars. So is there another way to test LT? The short answer is yes- by monitoring your heart rate, however the accuracy of this test is still in question. The alternate test determines an athlete’s average heart rate when they are exercising at their lactate threshold. A 30-minute exercise time trial where an athlete must sustain their best effort possible for the entire period will have the athlete exercising at their LT. If the athlete is pushing the test too hard (above their LT)- they will not be able to sustain effort throughout the test. This exercise test works best when done on a spin bike, treadmill, or in a pool that will not have obstacles. After a 10-minute warm up, start the 30-minute time trial with a heart rate monitor on. Record your average heart rate over the last 20 minutes of the test. This average heart rate is the heart rate associated with your lactate threshold. You can use your LT heart rate to help guide appropriate interval training alternating intensities above, below or right at your lactate threshold. This simple test can be a good way to approximate your heart rate and perceived intensity close to your LT, however it is important to remember this technique’s accuracy is still under debate. Having a baseline lactate threshold has been very beneficial in my training this past year. I have been able to see improvement and have learned more about the way my body works. While many coaches and athletes believe that training by feel is best, I know that I work best with numbers and analysis. Seeing the numbers gives me confidence in my training and allows me to adjust my workouts for my specific needs. I would recommend exploring possible lactate threshold testing if you are a number lover as well! If you found this article interesting, check out a recent post on resting heart rate's effect on recovery.